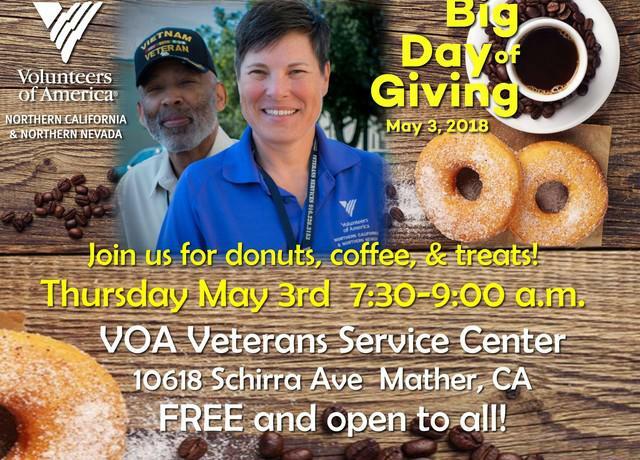 The BIG DAY OF GIVING is a moment in time each year to celebrate the spirit of giving... and Volunteers of America is proud to be participating again this year! COME VISIT US on Big Day of Giving! THURSDAY MAY 3rd 7:30am - 9:00am. FREE AND OPEN TO ALL! A program of the Community Foundation's initiative to grow local philanthropy, Big Day of Giving is a 24-hour giving challenge that brings together the region's nonprofit community to help raise much needed unrestricted funds and shine a spotlight on the work nonprofits do to make the place we call home even better.